This is especially neat, since only a few % of Tweets are geocoded. To be included in this map, you have to Tweet using a device w/ GPS (like your phone) and opt-in to sharing your location. Enough people do to make this fascinating map! 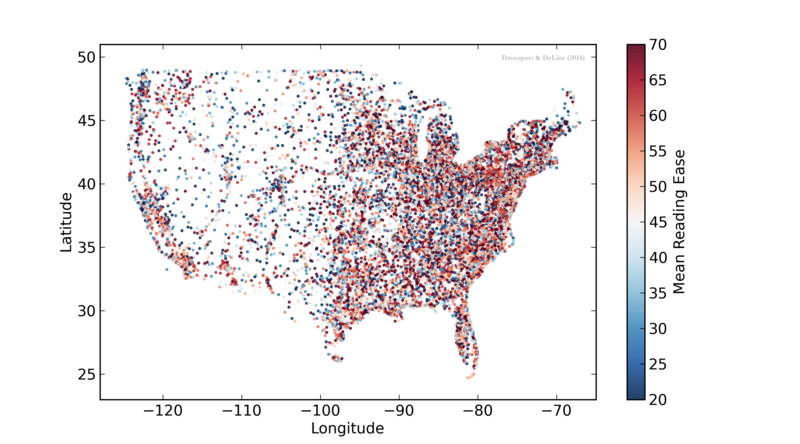 And finally, here's one I made in 2013 showing the average readability or reading ease of Tweets across ZIP codes [original blog post]. It's mostly noise, showing no real trend in readability geographically. What I did find was a significant trend with the % of college graduates per ZIP code, such that ZIP codes with more college grads were Tweeting more complicated language. I thought it was interesting enough to write a short paper on it. 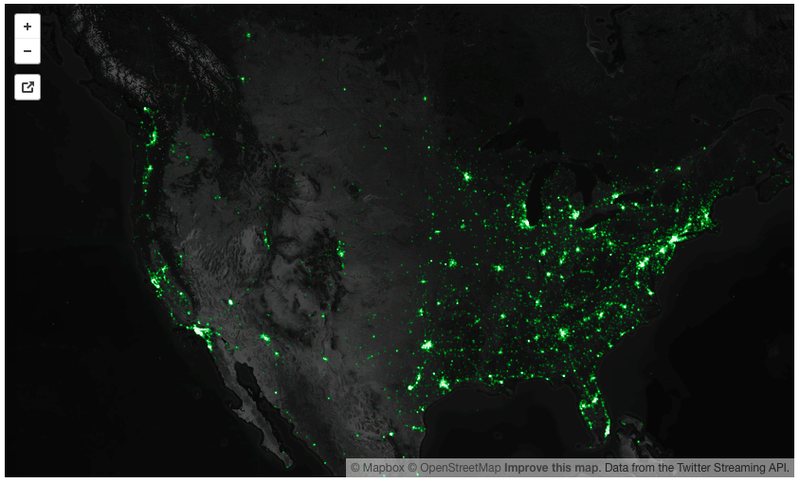 That is just 3 interesting maps of Twitter data, from thousands that have been made and shared online already. What consistently lights up my imagination is how data and social scientists working with companies like Twitter (and Facebook and Google) are using social media or search services, combined with geographic data, to study humanity. We might detect disease outbreaks, natural disasters, possibly intervene when people are feeling suicidal, or judge the mood of society on real issues. It's an amazing time we live in.